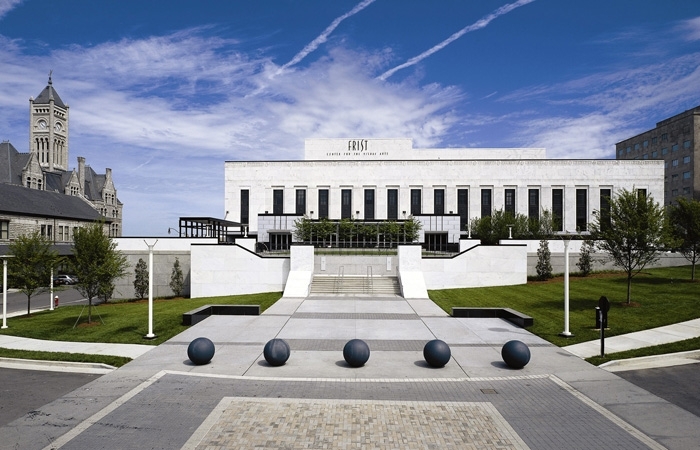 The Frist Center for the Visual Arts in Nashville, Tennessee has an exhibit entitled: Sensual Steel: Art Deco Automobiles, which runs through September 15, 2013. The cars are beyond fabulous, from an a romanticized period of Art Deco opulence of Pre-War Europe and the United States. A friend shared these photos with me and I had to share them with you (all photos from Jim Linz). Errett Lobban Cord rose to national prominence after rescuing the Auburn Automobile Company of Auburn, Indiana, in 1928. Seeing an opportunity for a uniquely engineered luxury automotive brand, Cord encouraged Fred and August Duesenberg to build what he envisioned as America’s finest motorcar. Noted racecar constructor Harry A. Miller and his associates were retained by Cord to engineer a radical front-drive chassis. The innovative and luxurious L-29 Cord, unfortunately introduced just as the New York Stock Market crashed, combined its engine, transaxle, and clutch into one co-located assembly, eliminating a conventional driveshaft. This permitted a 10-inch lower chassis and necessitated a lengthy hood that appeared even longer because the designer, Al Leamy, surrounded the radiator with an integrated sheet-metal assembly, finished to match the car’s color. The lowslung Cord’s bodylines were exquisite. Features include an Art Deco styled transaxle cover, an elegant streamlined grille that evoked the styling of Harry Miller’s racing cars, sweeping clamshell fenders, sleek body side reveals which accentuated the car’s length, and a low roofline. These are embellished by myriad Art Deco styled details ranging from accented fender trim, tapered headlamp shapes, etched door-handle detailing and tiny, but exquisite instrument panel dials. 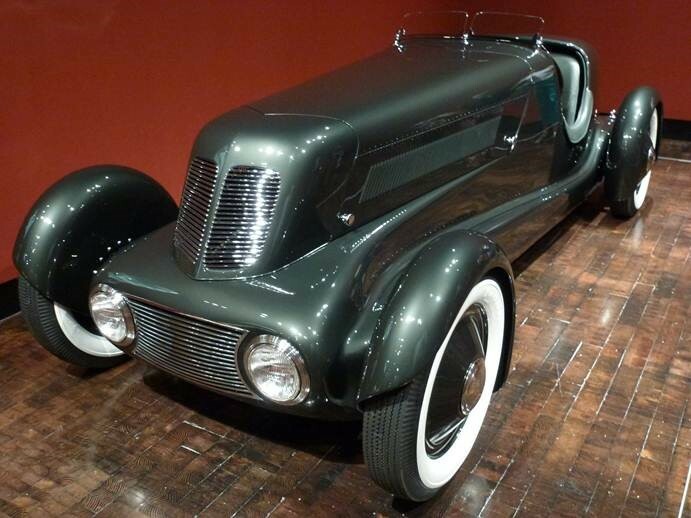 The L-29 Cord’s art moderne styling and engineering prowess attracted buyers of taste and style who were not afraid to try something different. 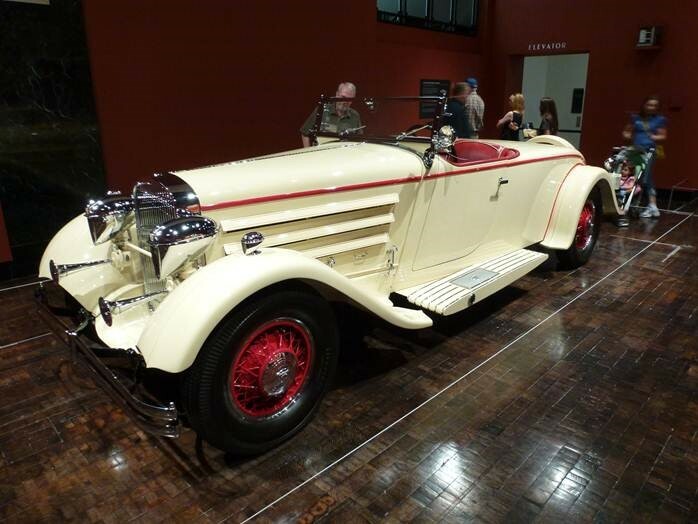 Owners included the era’s most prominent and controversial architect, Frank Lloyd Wright, who bought a new L-29 Convertible Phaeton in 1929 and drove it for many years. This stunning cabriolet, was purchased in the 1950s by the Frank Lloyd Wright Foundation, Wright’s legal caretaker until his death in 1959. 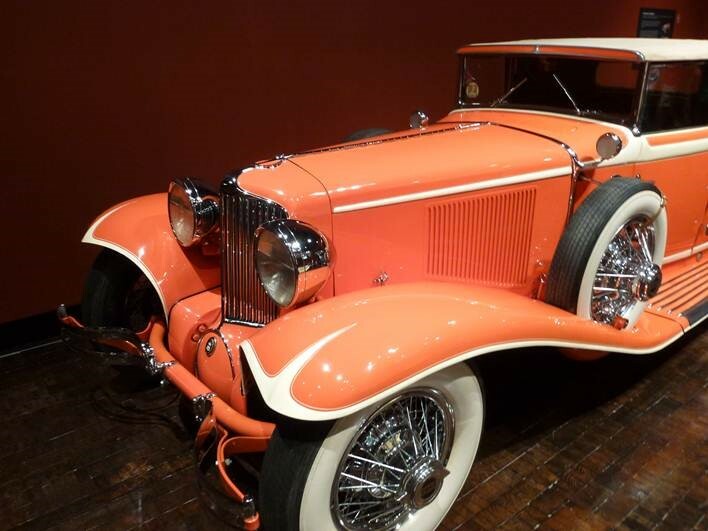 Wright had many of his cars painted in a bright hue called Taliesin orange. The finish of this Cord is a close approximation. When the Model Z Ace appeared, Autobody magazine enthused, “These striking designs put some of the old vim and vigor into the Jordan line. From its arrogant trumpet horns, flanked by racy Woodlite headlamps, emblazoned with cloisonné Jordan arrowheads, past the twin cowl spotlights to the raked continental spare, the roadster was a showstopper.” Seated at the Jordan’s wheel, the lucky pilot could imagine himself at the controls of the newest Supermarine air racer, which had a top speed of over 100 mph. By 1931, times were so hard at Jordan that when potential customers asked for a Speedway Series brochure, the response was a set of glossy photographs. They could no longer afford to print a catalogue. Very few Speedway Series cars were built. The lender searched for an Ace roadster for years before acquiring this example. It was missing many parts, including its ultra-rare Transitone radio, and it had the wrong fenders, but he recognized it immediately. It is probably the only survivor. With its 1,200-cc, 40-brake horsepower, in-line four-cylinder engine, the 1930 Henderson Model KJ Streamline could exceed 100 mph. 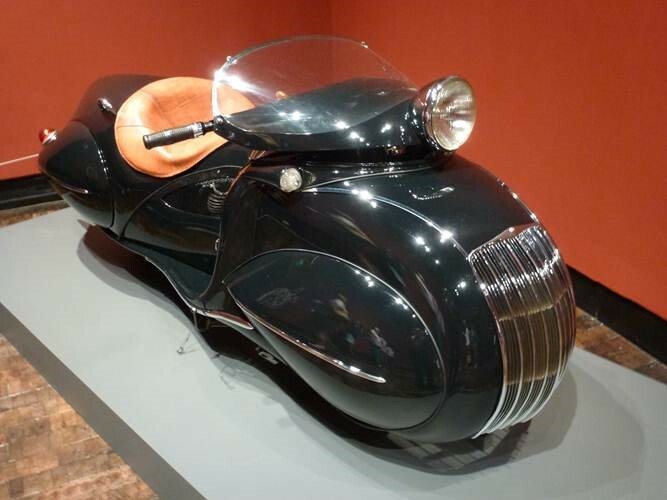 In an era when streamlining was used sparingly in motorcycle design, American Orley Ray Courtney’s enclosed bodywork was virtually unknown on production two-wheelers (except for a few racing machines), making the KJ an unusual and beautiful example of Art Deco design. Courtney believed that the motorcycle industry failed to provide weather protection and luxury for its riders. His radically streamlined KJ body shell was unlike anything ever done on two wheels. The sleek vehicle had a curved, vertical-bar grille, reminiscent of the Chrysler Airflow, and the rear resembled an Auburn boat-tail speedster. The panels were hand-formed of steel with a power hammer. * In 1923, Indian Motorcycle Company became Indian Motocycle Company and retained that name until the company closed in 1953. Edsel B. Ford, President of Ford Motor Company of Dearborn, Michigan, asked his styling chief, Eugene T. “Bob” Gregorie, to build a “continental” roadster that could have limited production potential. Gregorie sketched alternatives and then built a 1/25th scale model that he tested in a small wind tunnel. Because of its 1934 Ford (also known as Model 40) origins, the roadster became known as the Model 40 Special Speedster. Assisted by Ford Aircraft personnel, Gregorie’s team fabricated a taper-tailed aluminum body, mounted over a custom welded tubular structural framework. This car resembles the 1935 Miller-Ford Indianapolis 500 two-man racecars, but it was designed and built prior to their construction. This car’s long, low proportions were unlike anything Ford Motor Company had ever built. The Speedster weighs about 2,100 pounds. Its engine is now a 100-brake horsepower Mercury flathead V-8. This Model 40 was one of Edsel Ford’s personal vehicles. After his death in 1943, the Speedster passed through several owners. Bill Warner, founder of Florida’s Amelia Island Concours d’Elegance, read an article that mentioned that the Model 40 Special Speedster was owned by a fellow Floridian. Warner tracked the Speedster down, bought it, and later sold it to Texas mega-collector John O’Quinn. After O’Quinn died in 2009, Edsel Ford II arranged for the speedster’s purchase. In August 2010, this car was restored by RM Restorations, Blenheim, Ontario, Canada. This stunning Delahaye was one of French coachbuilders Joseph Figoni and Ovidio Falaschi’s first aerodynamic coupe designs. 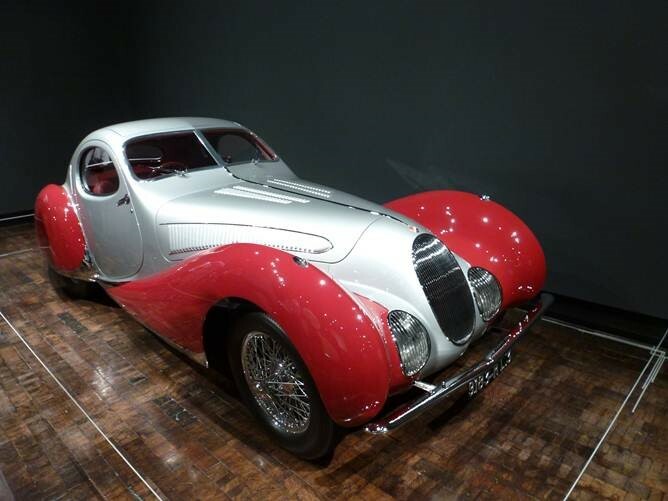 With its dramatic enclosed fenders and hand-crafted aluminum body, it was built on one of the fifty short chassis designed by the Delahaye Company for sporty two-seater models. It was equipped with a four-speed competition-style manual transmission, appropriate to a sporty coupe intended for rally competition. The dashboard included a Jaeger rally clock, and the trunk had only enough room to carry a spare tire. The engine was a highly reliable 4-liter Delahaye six with three downdraft Solex carburetors. The coupe’s striking design emphasized flowing lines with teardrop-shaped chrome accents on the hood and the front and rear fenders. The door handles and headlights were flush with the body. The dashboard was made of rich, golden wood, a Figoni &Falaschi signature. A sliding metal sunroof and a windshield that opened outward at the bottom afforded ventilation. A French racing driver named Albert Perrot commissioned this coupe. The Comtesse de la Saint Amour de Chanaz displayed it at a concours d’elegance in Cannes. It was successfully hidden from the Germans during World War II. After the war, it reportedly belonged to actress Dolores del Rio, a well-known owner of exotic cars who lived in Mexico City and Los Angeles. After several more owners, Don Williams, of the Blackhawk Collection, purchased the coupe in the late 1990s. Some time earlier, the Delahaye’s original engine had broken down; it was replaced with a postwar model, and the old engine was retained. In 2004, the Delahaye became the property of Mr. James Patterson, who re-installed the original engine and had the car beautifully restored. American aeronautical designer William Bushnell Stout modeled this sturdy Ford Tri-Motor after his own 3-AT aircraft. The futuristic Scarab (named for the Egyptian symbol based on a beetle) has a smooth and startling shape, with a tubular frame covered with aluminum panels surrounding a rear-mounted Ford flathead V-8. The Scarab’s passenger compartment is positioned within the car’s wheelbase. Access to the interior is through a central door on the right side, and there is a narrow front door on the left for the driver. This unusual configuration anticipated the first minivan. The “turtle-shell” styling celebrated the Art Deco influence, beginning with decorative “moustaches” below the split windshield. It continues to be evident in the headlamps covered with thin grilles, and culminates in fan-shaped vertical fluting, framing the elegant cooling grilles. 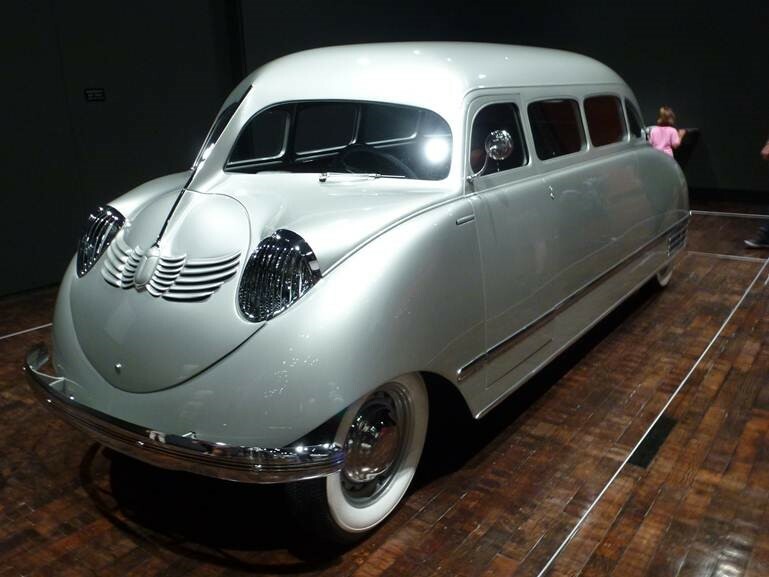 The Scarab’s design was even more radically different than other cars of the era like the ill-fated Chrysler Airflow. At $5,000, it was very expensive, and the Depression-wracked buying public did not recognize its many advantages. Stout’s investors, like William K. Wrigley, the chewing gum magnate, and Willard Dow of Dow Chemical, purchased Scarabs, as did tire company owner Harvey Firestone and Robert Stranahan of Champion Spark Plug. At least six cars were built; some sources say nine. Scarab number five was shipped to France for the editor of Le Temps, a Paris newspaper. In the early 1950s, this Scarab was offered for sale on a Parisian used car lot and returned to America. Parisian coachbuilders Joseph Figoni and Ovidio Falaschi produced this very special Delahaye 135MS Roadster for the 1937 Paris Auto Salon. Instead of conventional pontoon fenders that protruded from the car’s body, Figoni incorporated them into the body, heightening the impression of a singular, flowing form. Using Art Deco ornamentation, he punctuated the car’s hood with scalloped chrome trim that accentuated the curves of the fenders. Its all-aluminum body is built on a short 2.70-meter competition chassis. The dark red leather interior and matching carpets were provided by Hermès, a French company begun in the eighteenth century and known for its fine carriage building. This low, sleek car appears to be moving when it is standing still. The avant-garde design caused a sensation at the Paris Auto Salon, and its completion provided Figoni & Falaschi with the opportunity to file four new patents: for the aerodynamic design that stabilized the front fenders; for the disappearing front windshield; for the special lightweight competition tubular seats; and for the disappearing convertible top. The original design also featured a central light mounted in the front grille. The door handles were mounted flush to the body surface, augmenting the roadster’s modern, clean look. In early 1938, this roadster returned to the Figoni & Falaschi shop, where the central headlight was removed, and front and rear bumpers were installed to protect the car from daily driving hazards. André Dubonnet was France’s aperitif baron as well as an amateur racing driver and inventor. Dubonnet worked with engineer Antoine-Marie Chedru to develop and patent an independent front-suspension system in 1927 that was used by General Motors and Alfa Romeo. Following the 1932 Paris Auto Salon, Dubonnet acquired a French built Hispano-Suiza chassis, which he used to create a rolling showcase for his ideas. This car was designed by Jean Andreau, known for avant-garde streamlined aircraft and automotive creations, and hand-built in the coachbuilding shop of Jacques Saoutchik. The body resembled an airplane fuselage. Curved glass was used, including a panoramic windscreen (not seen again until General Motors cars of the 1950s), and Plexiglas side windows that opened upward in gullwing fashion. The side doors, suspended on large hinges, opened rearward in “suicide” fashion. A tapered fastback was crowned with a triangular rear window. The car featured Dubonnet’s hyperflex independent front suspension system. The original Hispano-Suiza chassis sat high off the ground, and the “Xenia”—named for Dubonnet’s deceased wife, Xenia Johnson—was built atop the frame, so while its overall appearance is sleek and elegant, it is a comparatively tall and heavy car. Dramatically different from its contemporaries, the “Xenia” appears far more modern than almost any other 1930s-era automotive design. The sporting Talbot-Lago T-150-C chassis inspired the design of many open roadsters and closed cars, most notably a series of curvaceous custom coupes. Sensational in their heyday, the French-produced Talbot-Lagos remain highly valued today. Streamlined, sleek, and light enough to race competitively, they were calledGoutte d’Eau (drop of water), and, in English, they quickly became known as the Teardrop Talbots. Famed Parisian coachbuilders Joseph Figoni and Ovidio Falaschi patented the car’s distinctive aerodynamic shape. 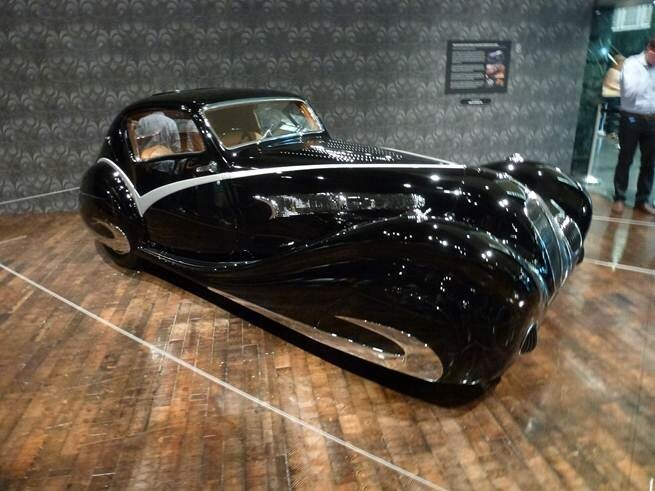 Figoni & Falaschi built twelve “New York-style” Talbot-Lago coupes between 1937 and 1939, so-called because the first was introduced at the 1937 New York Auto Show at the Grand Central Palace. Five more cars, built in a notchback Teardrop style, were named “Jeancart” after a wealthy French patron. 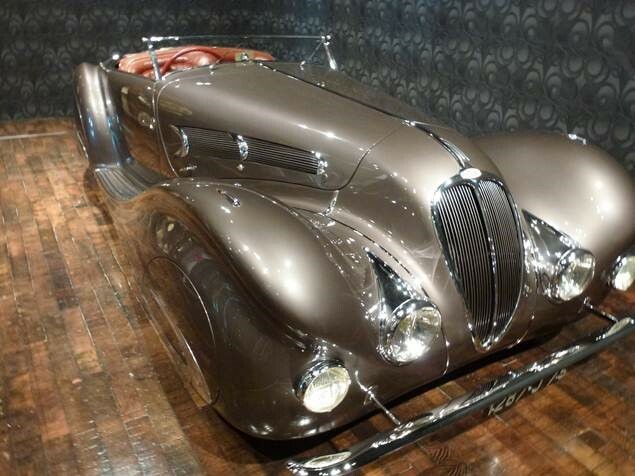 It took Figoni & Falaschi craftsmen 2,100 hours to complete a body. No two Teardrop coupes were exactly alike. Talbot’s president, Antony Lago, offered a top-of-the-line SS (Super Sport) version with independent front suspension. The competition engine, a 4-liter six cylinder topped with a hemi head, could be fitted with three carburetors for 170-brake horsepower. Some cars were equipped with an innovative Wilson pre-selector gearbox, with a fingertip actuated lever that permitted instant shifts without the driver having to take his hand off the steering wheel. In 1938, a racing model T-150C-SS Coupe finished third at the 24 Hours of Le Mans. This car was the first “New York-style” Teardrop coupe. Its first owner was Freddie McEvoy, an Australian member of the 1936 British Olympic bobsled team. A prominent player on the Hollywood scene, McEvoy’s ready access to celebrities made him an ideal concessionaire for luxurious automobiles. One of the most advanced designs of the pre-World War II era came from Czechoslovakia. Czech-based Koprivnicka vozovka evolved into Nesseldorfer Waggonfabrik and was renamed Tatra in 1927 after the country’s prominent mountain range. Tatra vehicles became known for innovative engineering and high quality. The engineer largely responsible was Hans Ledwinka, who had worked under automotive and aircraft pioneer Edmund Rumpler. Ledwinka was an early proponent of air-cooled engines, a rigid backbone chassis, and independent suspension. The Tatra was a perfect platform for the new emphasis on streamlining being pioneered by aircraft and Zeppelin designer Paul Jaray. A short front end flowed to a curved roofline that gracefully sloped into a long fastback tail. When integrated fenders and a full undertray were added, wind resistance was dramatically reduced. A prominent rear dorsal fin ensured high-speed stability. 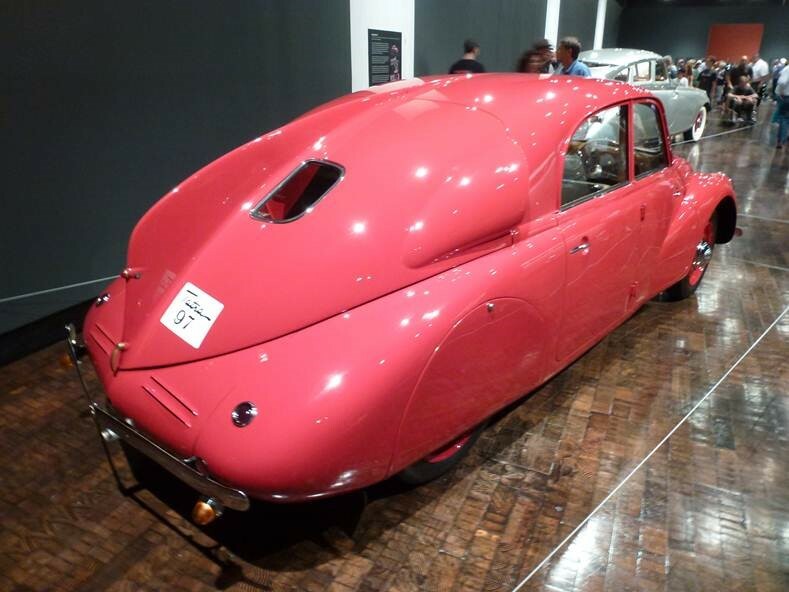 Tatra was arguably the first production car to take advantage of effective streamlining. The T97 used a horizontally opposed, rear-mounted, four cylinder engine with a rigid backbone chassis, four-wheel independent suspension and hydraulic drum brakes. Four were built in 1937, followed by 237 in 1938, and 269 in 1939. Top speed was 80.78 mph, which was truly remarkable for a 40-hp car at the time. According to automobile designer Raffi Minasian, “The Tatra T97 was one of the most interesting and well-developed engineering and design intersections of the Deco period.” It may have lacked the usual flamboyance of the traditional French coachbuilders of the period, but it manifested the expression of Art Deco design as a merger of science and industry where form was dictated by function. Detroit-based carmaker Chrysler touted the Thunderbolt and its companion, the Newport Phaeton, as cars of the future. With its aerodynamic body shell, hidden headlights, enclosed wheels, and a retractable one-piece metal hardtop, the sensational Thunderbolt conveyed the message that tomorrow’s Chryslers would leave more prosaic rivals in the dust. Following the design of Chief Designer Ralph Roberts, both the Thunderbolt and the Phaeton models were built by LeBaron, an American coachbuilding company. 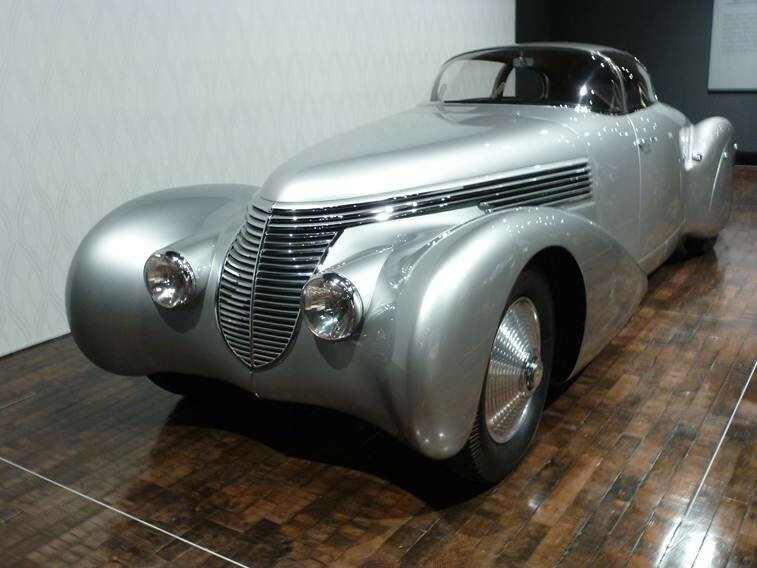 Associate designer Alex Tremulis suggested these cars be promoted as “new milestones in Airflow design,” hinting that without the 1934 Airflows, Chrysler styling might not have evolved so far. 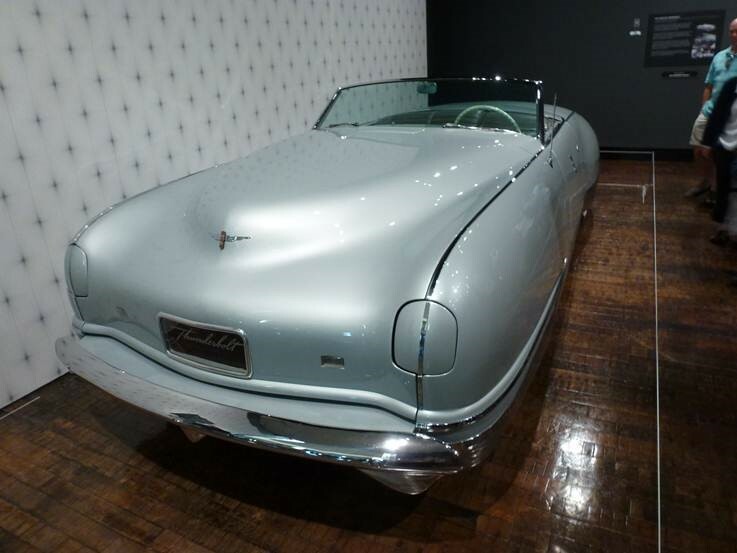 The Thunderbolt’s full-width hood, which flowed uninterrupted from the base of the windshield to the slender front bumper, and its broad decklid, were made of steel, as was the folding top, a feature designed and patented by Roberts not previously seen on an American car. Fluted, anodized aluminum lower body side trim ran continuously from front to rear. Removable fender skirts covered the wheels, which were inset in front, so they could turn. Priced at $8,250, eight Thunderbolts were planned, but only five were built, of which four survive. World War II’s interruption meant that while a few features found their way onto production Chryslers, these unique cars were not replicated when hostilities ceased. We will never see another period like this in automobile design, but the creativity of this period will live on through these kinds of shows. If you can’t make it to Nashville for this exhibit, you can see many similar (sometimes better) cars in the world-class automotive collections at the Petersen Automotive Museum at Fairfax and Wilshire, The Nethercutt Collection in Sylmar or the Mullin Automotive Museum in Oxnard (of all places).